In Sardinia, a few km from Cagliari you can find the sod farm “I giardini del sole”, which produces the best quality turf grass to be sold ready in sods, rolls and Big Rolls. Direct sale to private costumers, businesscompanies, public bodies and operators in the field of public and private green and sports. The varieties we manufacture: Gold (paspalum vaginatum), Miami (Tifway 419), Emerald, Tifgreen 328, Zoysia, St. Augustine (stenotaphrum secundatum) and Mediterranean (evergreen varieties of tall fescue). Good soil preparation is essential for healthy sod grass growth. By following these guidelines, you’ll be on your way to a beautiful lawn.Begin by removing any surface rocks or debris. 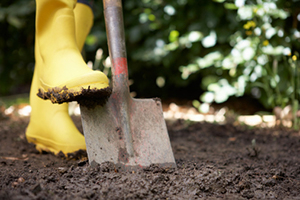 We recommend adding mulch and finely-ground gypsum to create a healthy soil. Till in soil amendments to a depth of 4″ to 6.” Now is also the best time to install your sprinkler system. As you are working the soil additional debris may appear which should be removed.Work the soil to create a level surface for installation. 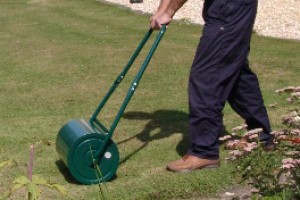 Water heavily to compact the soil, then use a roller as a final step to eliminate any air pockets. This will reduce settling which will lead to an uneven surface. Your final grade should be 1/2″ – 1″ below walkways, and 1/2″ below sprinkler heads. Be sure to install your sod on the same day it’s delivered. 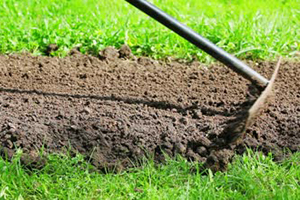 Begin by laying the sod lengthwise along a straight edge, such as a walkway or driveway. Joints should be butted tightly together, but not overlapping. Stagger the sod pieces similar to a row of bricks. You will need to use a sharp knife to cut around curves or sprinkler heads. 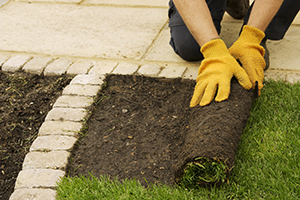 Begin lightly hand watering each piece of sod throughout the installation process. It is imperative to keep the sod moist. This will prevent wilting and drying the delicate roots. Once all sod has been installed, water lightly and then roll your newly installed sod once again to ensure a level surface and to press out any air pockets.Newly installed sod should be kept consistently wet for the first 7-10 days. However, do not let water puddle. Average watering time is 5 to 10 minutes, 4-6 times per day. 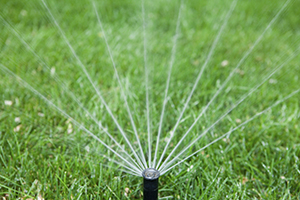 Water application rates vary greatly among sprinkler brands and you will need to adjust this recommendation according to your situation.If you notice water beginning to puddle, we advise decreasing the watering time and increasing the watering frequency.Once your sod grass is established, we recommend watering 2 to 3 times per week for 10 to 45 minutes. Early morning watering is best.To maintain your new sod grass lawn you should begin mowing no sooner than 2 weeks after installation. 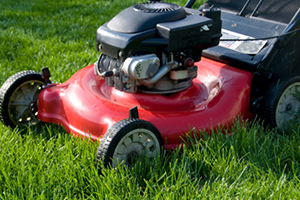 Mow frequently enough that you remove no more than 1/3″ of the height of the grass.Fertilizing every 30 days is an important key to a healthy lawn. Per iniziare la cura del prato, si dovrebbe iniziare il taglio non prima di 2 settimane dopo l’installazione. A marzo applicare un concime contenente Azoto(N), Fosforo(P) e Potassio(K); l’effetto di questi prodotti permane per circa 2/3 mesi. Distribuite dosi variabili dai 25 ai 35 grammi al metro quadrato se si utilizzano concimi con percentuali in Azoto dal 15 al 20%(esempi di prodotti in commercio: 17-6-12, 15-9-15, 20-5-8 ecc. ), applicando il dosaggio maggiore suggerito, per i concimi con percentuali in Azoto pari o inferiori al 15% e viceversa il dosaggio minore per quelli con Azoto pari o superiori al 20%. A maggio eseguire una concimazione con un prodotto contenente N-P-K. Utilizzare dosi variabili dai 20 ai 30 grammi al metro quadrato con gli stessi criteri sopraccitati ma con l’Azoto a pronto effetto. A settembre eseguire una concimazione con il medesimo prodotto e dosaggio utilizzato nel mese di maggio. Applicare sempre il concime su foglie asciutte ed irrigare subito dopo con volumi normali. A metà marzo, prima della ripresa vegetativa del prato, è consigliabile effettuare con un rastrello o un verticutter l’asportazione delle erbe infestanti e lo strato dei tessuti secchi accumulati durante l’inverno, dopodichè tagliare il prato il più basso possibile. Questa operazione risulterà utile per la qualità del prato (esclusa varietà Mediterraneo). Nel periodo tra agosto e settembre si deve applicare un formulato insetticida per larve da prato, per difenderlo da questi spiacevoli ospiti. Quando la temperatura scenderà ai 5°, il prato entrerà in riposo vegetativo perdendo il colore verde e interrompendo l’attività vegetativa, perciò risulterà inutile lo sfalcio fino a marzo. For large areas, such as football fields, golf, polo, tennis etc. o for the construction of public parks or large residential gardens, in a very short time, we can harvest turfgrass by big rolls. The Eco Green Company, has the latest generation machinery for harvesting and laying big rolls.